Radiation produced by the tsunami-stricken Fukushima nuclear power plant in Japan has been confirmed off the coast of Canada, as the Japanese struggle to contain a number of leaks. The levels, however, are too low to pose a threat, scientists say. Trace amounts of Cesium-134 and Cesium-137 were discovered in samples collected on February 19 in the waters near Vancouver Island in British Columbia, according to Woods Hole Oceanographic Institution scientist Kern Buesseler. "Radioactivity can be dangerous, and we should be carefully monitoring the oceans after what is certainly the largest accidental release of radioactive contaminants to the oceans in history," a statement from the institute read. But they have insisted that marine and human life will remain unscathed, as the levels are extremely low: So low that a dental X-ray would expose a person to 1,000 times more radiation than swimming off the coast of Vancouver every day for an entire year. By contrast, radiation found off the Fukushima coast in the immediate aftermath of the March 2011 catastrophe showed readings of a million times more Becquerels per square meter than the 5.8 Becquerels of Cesium-134 and 137 found off Canada. A similar situation to Woods Hole’s report arose last year, 161 kilometers (100 miles) off the coast of northern California. Readings did not show an advance toward the rest of the US since then. Four years ago saw a catastrophic tsunami and earthquake batter the Japanese coastline north of Tokyo, setting off a catastrophic chain of events that involved triple nuclear meltdowns and displaced over 160,000 residents from the surrounding region. The world’s worst nuclear disaster since Chernobyl in 1986, its consequences threaten to take decades to undo, as not only air but people’s livelihoods are suffering. A number of radioactive leaks and other engineering difficulties have since plagued the Fukushima Daiichi power plant, with the government and plant operator Tokyo Electric Power Company (TEPCO) struggling to contain the radiation with enormous amounts of money and technical ingenuity, albeit with varying success. Management of the situation has likewise been marked by mishaps and scandalous revelations that have put a serious dent in TEPCO’s reputation. 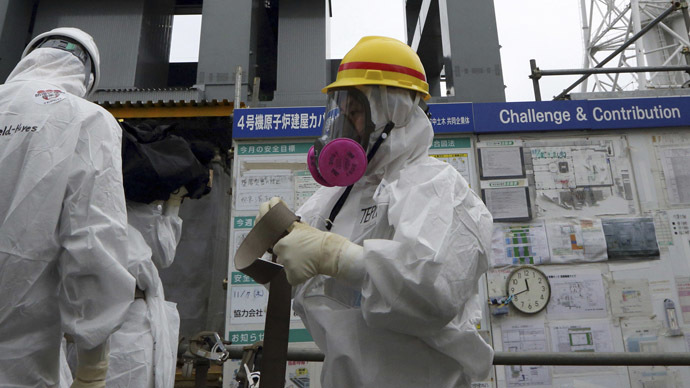 The plant’s operator announced a week ago its plans to disclose all data on radiation levels recorded at the site in response to mounting criticism over its lack of transparency. Some situations involved outright negligence and further served to undermine public trust. In late February the company admitted to concealing a radioactive leak for 10 months, citing an ongoing investigation. Fishermen were left in “shock” as TEPCO, without knowing the true scale of the problem, chose not to inform anyone. The operator usually relies on them for permission to dump any radioactive materials in the water. TEPCO, who’s been blamed for spending billions of taxpayers’ yen on failed initiatives to contain the radiation, also recently announced a plan to build a 400-kilometer chain of sea walls to fend off any future natural disasters. But that alone will cost a cool $6.8 billion, and there’s no telling what damage it would cause to marine life.